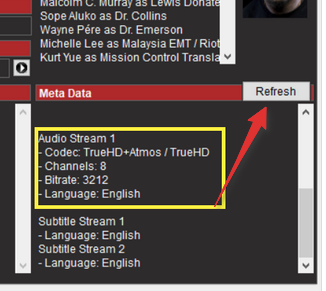 You have to "Refresh" the meta data to replace the codec info with your mapped codec. Then the logo should be showed. (2019-01-09, 12:09)DanCooper Wrote: You have to "Refresh" the meta data to replace the codec info with your mapped codec. Then the logo should be showed. How do I refresh the meta data. I only scraped the show after the mapping. Regarding my first question, any thoughts? Not sure. If you look at the other mappings, they have spaces. I will test it when I get home today. Would it be possible for a future version of Ember to scrape the following rating tags for us & add them to the .nfo file? The ratings node is already implemented for next release, user rating is already implemented in latest releases. I've to add a new setting to select a rating provider for the "old" rating and votes nodes and metascore. Is "metascore" the value from Metacritic? Why you written a "Double" value (6.3)? Metacritic normally use "Integer" values (from 0 to 100). easier & quicker (Selection of Posters, Fanart & other art). I scrape every movie manually. Any idea when the new Ember would be released? Hi - any eta on beta or stable release , the alpha builds have been sporadic at best! We have to limit the ammount of downloaded images to a useful value to prevent useless traffic on the image providers. The limit for automatically downloaded Extrafanarts and Extrathumbs is 20. Notes: Most skins can't show more than 4 Extrathumbs. It's still possible to manually select as many as you want in the "Image Select" dialog. We have to limit the amount of images downloaded to a suitable value to prevent needless traffic on the image providers. I'm trying to scrape TV Series Doctor Who (2005) but EMM seems to be stuck on Scanning Meta Data. The series has 170 episodes on 11 Series (and 1 Specials folder). EMM has been Scanning Meta Data now for almost 2 hours with no changes. (2019-02-16, 17:53)spinecho Wrote: Hi guys. No matter, it's finished...seems it just takes absolutely AGES to scan 170 odd episodes!